Welcome to Logic Group support section. Here you will find technical information about our products (documentation, application notes and firmware updates). Firmware is updated by means of “Over The Air” (OTA) device update. It is not required to connect these devices to a controller or a PC via cable as the device firmware can be updated directly over the Z-Wave wireless system. The firmware files that can be downloaded from here has file extension .OTA. In some controllers it is required that files must have file extension .HEX. In these cases the file can just be renamed as the firmware file is already a hexfile. Please contact support@logic-group.com if you are missing any material or have questions about our products and firmware. Try our new Firmware Loader Common PC Application for Over-The-Air firmware updates. The application can be used for any Logic Group device, just download and unzip the desired .OTA or .OTZ file from our list below to use with the application. See the guide for instructions (in Danish only). NB. Do not use a USB Z-Wave Interface that is in use for a running controller, as the firmware update software will completely reset the interface! Control LEDs by Z-Wave commands (Command Class Basic Set) by setting configuration parameters 4-9 (value 8). NB. After doing an update of a ZHC5002 device to firmware version 2.x from a version 1.x, it is required to remove the device from the network and re-add it! Supports security (S0) for secure adding of ZHC5002. This firmware still supports commands from non-secure devices when configuring to accept non-secure commands (see configuration parameters 27 – 32). This Firmware version solves the issue where the VERA controller gets stucked in the inclusion process with the message: “Purging Associations”. NB. After doing an update of a ZHC5010 device to firmware version 2.x from a version 1.x, it is required to remove the device from the network and re-add it! Correction of a minor bug where Multilevel Switch commands sent from the Controller (or other devices) to ZHC5010 wasn’t sent further to devices in the ZHC5010 device association groups. Supports security (S0) so that ZHC5010 can be added securely. It is also possible to configure that Z-Wave commands sent to devices in each of the ZHC5010 association groups are sent non-secure in order to support non-secure devices (see configuration parameters 33 – 36). This firmware version will function in both secure and non-secure installations. Fine-tuning of the button detection timing, see configuration parameters 28 – 32. Possibility of controlling the LED’s by means of standard Basic Set on/off commands, so now all Controllers/Gateways will be able to fully control the LED’s (Configuration parameters 3 – 6, value 8). 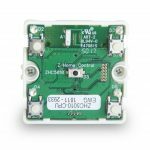 Correction of an issue in relation to HomeSeer network controllers with older USB network interfaces, that makes it almost impossible to include ZHC5010 into the controller. Corrected: fault in dimmer-command sent to light dimmers could result in that the light was regulated very fast for some dimmer types (especially AEOTEC dimmers), it was practically impossible to regulate the light to a certain level – the fault has been corrected in this firmware version. Improved event handling; it will now ensure that all pending messages will be sent to the devices in the association groups, even when new button activations (or incoming command messages) are made while sending out messages. Improved handling of incoming notifications in order to better serve the proxy mode. New relay modes (see configuration parameter 15 in the user manual). Allow double-press central scene notification, even when the house cleaning mode is disabled. Improved button driver; button double-press is now interpreted as only one event (not first a single-press and then a double press). Corrected fault in that incoming button command messages did not make a correct activation of devices in the Multilevel Switch association groups. Central Scene Command Class is now presented correctly, only in the root device and not in the sub-devices. The sequence number in the Central Scene notification is now updated correctly in order for the controller to detect duplicate scene notifications. Indicator Command Class version 2 is introduced (see further description in the user manual). When configuration parameters for the LEDs are changed, they will now be reflected immediately. With this update inputs can control the outputs directly. The standard configuration is that the inputs control the outputs and the inputs are now edge triggered – so that each activation of an input will the toggle the on/off status of the output. 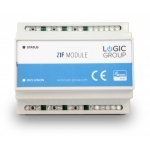 This new default behaviour of the module means, that the module now – out of the box – will function as a stepping relay. NB. When doing an update of the firmware in ZIF5028 to version 0.7 it will loose its network information and will require re-adding!